You get 25 Barnyard Bucks on your birthday! Earn 1 Barnyard Buck for each R25 spent. 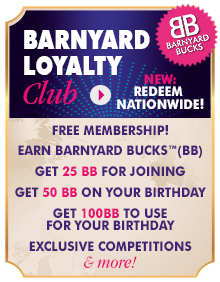 Earn 25 Barnyard Bucks on your birthday. The value of one Barnyard Buck is one Rand.